Brand New 7BR/6.5BA Beach Home with Private Pool - Incredible! 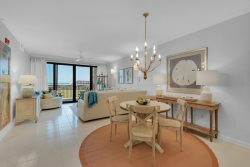 Welcome to one of Pensacola Beach's most luxurious vacation homes. This is the second custom home recently built by this builder and both properties are exceptional. This 4000 square foot home was completed in June 2016 and has had record breaking success since. If you are looking for a top of the line vacation rental to sleep 16 then this is the house for you! The first floor of this home has an open floor plan with a huge living room, dining room, and large kitchen. This home gives an incredible first impression as you walk in the front door! It is impeccably decorated in colors that compliment the natural surroundings of the gulf coast! You will feel as though you have stepped in to a magazine cover! The living room is divided into two seating areas. The first area has an extra large sectional that provides viewing for the flat screen.The second grouping is a conversation area which is a perfect place to play board games, sit and chat, or read a book. The kitchen is an absolute chefs dream! It has all viking appliances which include a large gas stove with 8 burners as well as a a wine fridge. It also comes equipped with all of your basic kitchen needs.If you are a "foodee" this kitchen will not disappoint! The first floor of the home also has two beautifully decorated master suites. Each of them has a king bed, an attached bathroom, as well as a large flat screen. A large laundry room and half bath are also on the first floor of the home. The second floor of the home is just as amazing as the first! The views from this level are incredible and can be enjoyed from the vast amount of deck space facing the gulf. This floor also has a large living area that is a perfect get away for teens or even a full second family! In this room you will find plenty of seating, a separate table for four, and a huge wet bar area with a full size fridge, ice maker, and microwave! The second floor also has four bedrooms each with an attached bathroom and a large flat screen. One of these bedrooms has a king sized bed and the other two have two queens each. The fourth bedroom upstairs is perfect for the kids and boast 4 custom made queen sized bunk beds! This room is definitely a favorite! The exterior of the home features large amounts of deck space along with a beautiful in ground pool. (The pool can be heated upon request at the rate of $75/day. ) This outside area has lots of space for hanging out as well as a sandy area that is perfect for corn hole or for kids to play in the sand. This space is also the grill area as guest can enjoy the large gas unit to barbecue! This home also has an elevator that will take you from the bottom floor to both top living levels. We do charge an elevator fee ($150 ) to unlock the unit. This is to prevent the elevator from being used as "entertainment" and due to the extremely high cost of elevator maintenance and repair. We do not allow large parties or events that include outside guests without management approval. Events such as wedding receptions and re-unions are allowed but require an event fee of $1000. Our event and wedding seasons are anywhere from Mid August to Mid November in the fall and Mid April to Mid May in the spring. Summer schedule is Saturday to Saturday with some exceptions being Blue Angels week and Memorial Week. The demand for "Beach Elite" will be strong, so it is suggested to book a year in advance to lock down your dates for the summer. The team is fantastic from beginning to end. Very responsive to our needs onsite. Love that we can easily make payments on the website instead of calling in with credit card details. We received a quote for our stay promptly and the different costs were fully explained. There were no added costs (surprises!) prior to arrival which is always nice. We arrived on the heels of a tropical storm from Hurricane Gordon. Local authorities were asking for residents/visitors to be off the streets by 4 pm. The staff was extremely respectful to that requirement and allowed us access to the house at 1 pm. That night (September 4th) the winds were pretty bad and we could feel the house move with the wind gusts but it was sturdy and held up well. We did have a water leak and the pool needed cleaning the next day but it was all handled extremely well and quickly. Contractors who arrived for the next day were polite and informative. Made all of us feel very safe.